As marketers, a question clients always seem to ask us is what else could we be doing? Something different, something creative, something outside the box? Someone once told me that there is no box, meaning never limit your creativity and ideas, always brainstorm and think differently. With that approach thinking outside the box lets us really discover new opportunities for our clients and their brands. With the trend towards digital continuing to increase, there is something magical and authentic that lies in experiences. Specifically, experiential marketing as an opportunity to infuse energy and surprise into a brand’s marketing efforts. This strategy invites and encourages consumers to directly participate with a brand or a brand experience. It takes what is normally a very passive encounter like seeing an ad on YouTube, listening to a commercial, driving by a billboard and turns it around to put the customer in the driver seat. 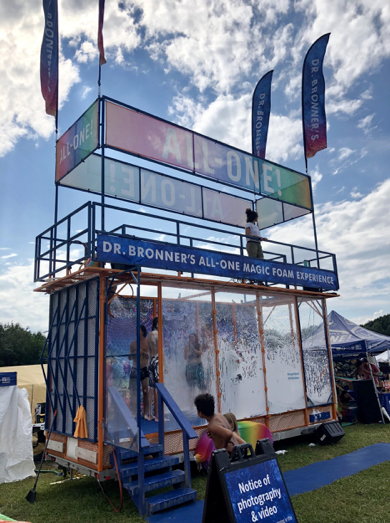 Recently I went to a music festival and got to experience a brand I admire, firsthand, Dr. Bronner’s and their Magic Foam Experience. To be honest, I was skeptical at first. Not about the product, I use their product all the time, but more about getting in this box, or shall we say human carwash, with 30 of my closest friends, and being soaked head to toe in their lavender smelling soap. But for better or worse I was going to do this and loved every minute of it. The concept was genius. 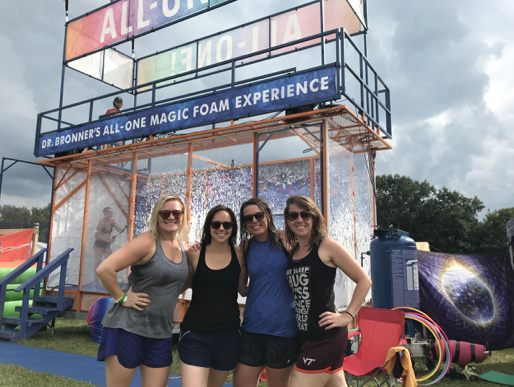 They started with a simple, normal everyday activity and took it to the next level, which added to the festival-goers experience. Their product was front and center but not in an ostentatious way, but rather super authentic. A quick and easy shower and the offer to snag a few sample products made me wonder how many music fans they quickly turned into Dr. Bronner’s fans. And the best part, their Magic Foam is safe and biodegradable. A win-win. Good for you and good for the environment. What this experience taught me is that something simple but relevant can invite a customer to try a product and in turn hopefully create a fan. How are you connecting authentically with your customer? Christie Hach is the Account Director for Dotted Line Collaborations, a strategic marketing firm focused on solving business problems with a fresh approach, headquartered in Richmond, Virginia. When Christie isn’t helping our clients find their purpose and build their business, you can find her listening to live music or playing with her dog, Riley.